When looking at these photos the first thing that sprung to my mind was 'granny-meets-military-chic'. My favourite trend this season is by far pastels, so I thought I'd embrace it in full swing with this pink ensemble. I had originally styled the outfit without the coat, boots and bag; however I eventually decided to give it more of a grungy edge. It's funny how accessories can change the entire aesthetic of an outfit, and take it from drab to fab with no effort whatsoever. Despite this, I did get a few odd looks and sniggers wearing this into my local town. If I'm honest, I couldn't give two hoots! I'm all for promoting individuality and uniqueness when it comes to personal style, and if somebody dislikes that then I try not to let it get to me. I always think that you should dress for yourself and nobody else; that way you can explore different styles and feel confident with what you wear. You should never try to change yourself in an attempt to fit in- just stay true to yourself! There are an abundance of facts that come with life, and one of them is that you can never please everyone; so you should give up trying and just focus on pleasing yourself. Despite this weekend's arrival of sunshine, I picked up a terrible cold which has resulted in me feeling and looking like the living dead. Walking around with watering eyes and a red nose is never a good look, regardless of how good looking you may be. I'm sure even Alexa Chung would struggle to pull it off! I'm keeping my fingers crossed that my cold will be gone within the next few days. I don't think I can tolerate another outburst of sneezes! Hopefully you're all feeling much better than I am! Wow! I'm beginning to run out of words to describe how amazing you look in day to day life...so I'll just have to settle for the word - Chung-tastic! Sarah Colee - you are chungtastic! And how dare you?! Of COURSE Alexa could pull off having a snotty nose! I absolutely love the pastel shades with black lips and black boots! Très O.A.P-soldier! Are you using Canon T3? Answer me on my blog please so I would know you actually did xD If you are using it, would you recommend it for my blog? Cute photo's and i love your hair! Sarah! 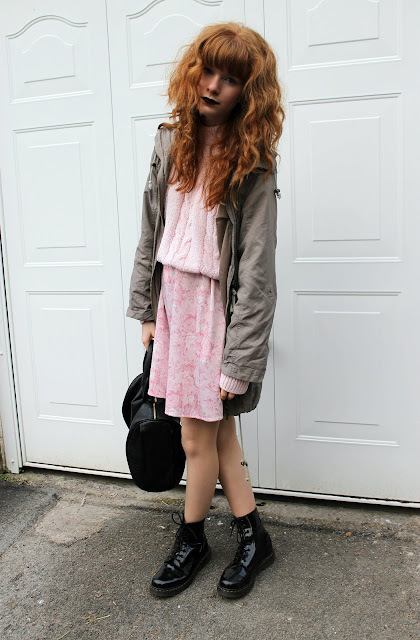 You look so stunning, I love the grungy aesthetic but the gorgeous pastel pinks add a bit of a girly touch. I love the contrast! 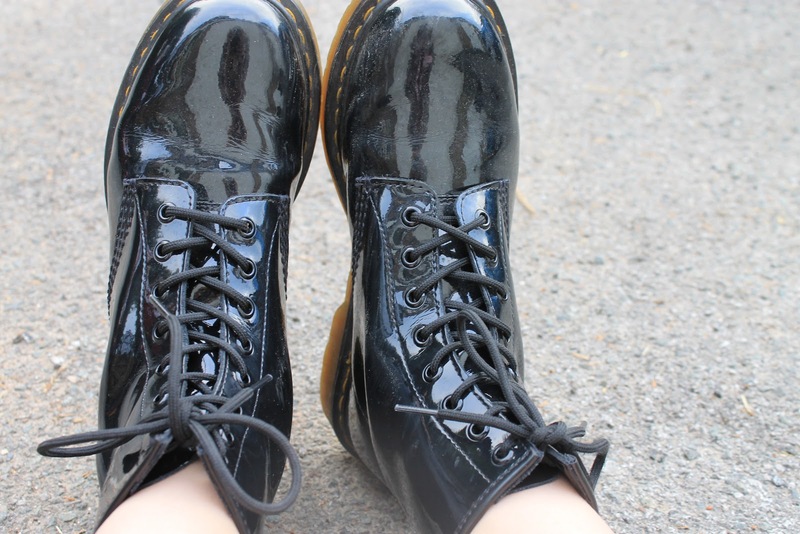 I love your shoes, this will probbaly sound a bit weird but I lost the glossiness to them! The lipstick shade really suits you, your hair is looking like perfection as always! I really love how your blog has really developed through on and throughout! Your style is just the epitome of perfection and I adore your take on the grunge aesthetic. Nobody pulls it off better than you! love the pastel pink with those dr martens!! love the look, nice blog!! We Love the look! Nice coat! Wow, that shade of lipstick looks amazing with your beautiful skin color! you look great! Really nice style! I want your jumper so bad! Ive been looking for a pale pink cable knit for sooo long! Geezus woman, I am in love! Love it from head to toe! Fab lipstick! Such a fantastic outfits :) I love the outfit with docs. Perfect. Love you outfits and blog. Deffo new follower!